Properties in Province of Barcelona average 4.4 out of 5 stars. Property 1: BED, A 35 MINUTES OF BARCELONA. Authentic country house with swimming pool in nature park Montseny. Property 13: Authentic country house with swimming pool in nature park Montseny. Property 34: 17th century farmhouse in Bages, near Montserrat. Property 37: Completely restored 17th century manor with a swimming pool. 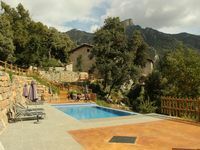 Nice and quiet house near Barcelona, pool and private barbecue. Property 46: Nice and quiet house near Barcelona, pool and private barbecue. We stayed here while skiing at the Pyreness. It was a perfect get away! The house has all the modern amenities set in a beautiful mountain town. There is an indoor heated pool and sauna, which we used every day. We loved exploring the small towns nearby. Owner was very responsive. Such a wonderful stay!! !